From the name QuickPaySurvey.com sounds like a website that can help you earn fast money by taking surveys. 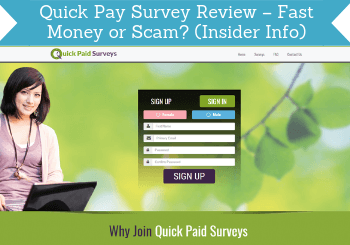 But is Quick Pay Survey a scam, or is it really one of the fastest paying survey sites? I have joined and tested the site myself and compared it to the hundreds of other survey sites I have tested. In this Quick Pay Survey review I will give you all the details, so you know, what you can really expect from this paid survey site. What is Quick Pay Survey and what does the site offer? Quick Pay Survey is a website, where you, as the name suggests, can earn money by taking surveys. But it also offers a few other ways to earn. So let’s go over what earnings methods it offers, and how good they are, so you can see, if it will be worth it for you or not. Obviously Quick Pay Survey offers paid surveys. It offers surveys through survey routers, which means that you in theory can take many surveys every day, as these routers will match you with available surveys. Quick Pay Surveys offers surveys through two survey routers. It does however only offer two survey routers, which is not a lot compared to other sites. As you can see on the image above, you will usually get around $0.50 per survey. This is not a lot compared to other survey sites. Some survey sites actually offer surveys through the exact same routers but for a higher reward. 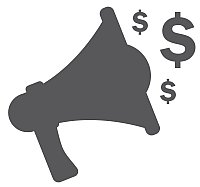 On average, you will for example get 80 cents per survey you take through Yoursurveys on PrizeRebel, where you on Quick Pay Survey only will get 50 cents for the exact same surveys. This can make quite a big difference in the long run. You definitely can earn some extra cash by taking surveys on QuickPaySurvey.com, but in my experience it does not offer as many opportunities as other sites. In addition to this, you will get higher rewards for the same surveys on several of the top paying survey sites. But let’s also look at what else Quick Pay Survey offers, as it has other ways to earn as well. As many other survey and get-paid-to sites, Quick Pay Survey has a paid offer wall, where you can earn by taking paid offers. At first it looks like there will be a lot of paid offers. However, the times I have been on the website, it has only had the two same survey routers, you can find in the survey section. There is however a place on the site, where you can find more paid offers and for example get paid to sign up for free trials, download apps, etc. It is by going to the main dashboard you get to right after logging in. Here you will find an option called “earn points”. You can find more offers through the “earn points” button. Here you can find a couple of offer walls with quite a few offers and ways to earn. However, again the offers do like the surveys on Quick Pay Survey not pay quite as well as on other sites that have the same offers. You can also find offers in the side bar, where several banner ads are displayed. Not all of these are worth it though. I have for example seen an ad for the survey site Cash4Offers, which in my opinion is a waste of time. So check up on the sites, before joining through the banner ads on Quick Pay Survey. You can also earn by inviting your friends to join QuickPaySurvey.com. If a friend you invite joins, you will get 15% in commissions of whatever he/she earns. This will not affect the size of the rewards they will get, but is paid by Quick Pay Survey to thank you for inviting other people. It takes quite a lot of friends to make any real money like this – especially because of the limited opportunities on Quick Pay Survey. But it can be a way to earn some extra cash. Quick Pay Survey offers something not many survey sites does. You can get paid to read emails from them. This is something you will automatically sign up for, when you join the survey site. You cannot cancel these emails unless you also cancel your membership with Quick Pay Survey. The emails will not pay you a lot, but will also not take long. It is just to click a button, when you receive on email, and then you will be taken to an ad, and have to confirm you have clicked. There is however more to this option, and it can be a bit confusing, so let me try to explain. You can in a way choose yourself how much you want to get paid for these emails (between 1-5 cents per email). The paid emails option can be a bit confusing. You can also choose which days you want to receive these emails on, as you can see on the image above. But Quick Pay Survey has something they call Guaranteed Paid Emails (GPE) – this is a number from 0-100. The higher rate you will choose to get per email, the faster this GPE will go to zero. When it is at zero, you will not receive any more paid emails. You can then use points, you earn to increase your GPE again, or you can increase it by taking surveys or offers. In my opinion this is an overly complicated system for something that pays so little. But if you like being a member and use the other options anyways, then the paid emails can be a way to earn a little extra. When you join Quick Pay Survey, you will get a joining bonus of $3, once you have confirmed and activated your account. This is a good joining bonus and great start. However, this money are of course only worth something, if you get to the payout threshold and can get rewards you like, so we will look into how your options are here below. You have the option to get cashback when you shop, if you click a link in the shopping section of Quick Pay Survey. Or you can find a link to coupons, where you can save money. You can find these sections in the menu tab called “more”. The coupon option is really just a link to coupon.com, so it does not earn you anything on Quick Pay Survey. It is just a link they get paid to advertise. It is also not very many shopping opportunities it offers, and it is of course not as such a way to earn, as you have to spend to get the cashback. The cashback section is not very big. But if you are going to buy something in one of the shops anyways, you might as well get some cash back. However, these offers are mostly for the US. 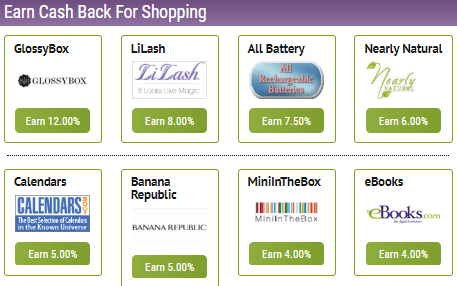 Also, if you like shopping online and want to get good cashback opportunities, I would recommend you to check out Swagbucks instead, as it has MANY more shopping offers and savings. How you can get paid, and how fast you can get paid, is important on any survey site. Quick Pay Survey offers PayPal and Amazon gift cards. Personally I prefer survey sites that pay through PayPal, so great it has the option. However, you have to be aware that for some tasks you earn cash. These can be paid out through PayPal. For other tasks you earn points – these can only be paid out as Amazon gift cards. You can exchange cash into points, but cannot exchange points into cash. If you just look at the name of Quick Pay Survey, you would probably think it would be very fast to then get to the payout threshold compared to other sites. This is however NOT the case. The payout threshold is $15, which is actually not too high. But you have to think about that not everything you earn will count towards this. Some tasks will take you closer to the PayPal payout, and others will take you closer to the Amazon payout. So it can therefore take quite a while to get to one of them. Especially because the rewards are not as high as on some other sites, and it does not have as many opportunities. The website does in my opinion not live up to its name. Compared to the truly quickest paying survey sites, it takes a long time to earn here. It is definitely possible to make some extra cash on Quick Pay Survey. But you should in my experience honestly not expect too much. It can take you quite a while to get to the payout threshold, and it does not give very good earning opportunities compared to many other sites. So I am not impressed with the site and the earning opportunities it has. Quick Pay Survey does not have an app, but it is still fairly easy to use on a mobile. It is always great when a survey site can be used on mobile, so you can earn when and where you want to. QuickPaySurvey.com is optimized for mobile and works well on most screens. Be aware that most offers the site has are however through third parties. So when you for example take a survey, it will open in a new screen. Not all of these surveys or offers will be optimized for mobile, so in some cases you have to scroll in and out a bit. You can join Quick Paid Survey no matter where you live in the world. The amount of opportunities will however vary depending on the country you live in. Also, be aware that no matter what country you live in, your account will be is USD. It might also not be convenient to get an Amazon gift card in USD, if you live in other parts of the world. Overall, there are in my opinion better survey sites with more opportunities in your country no matter where you live. It is always good to know you can get support, if you need. Quick Pay Survey has an option, where you can submit a question through a form on the website. It does however not say how long it will take to get an answer. I have not needed to get support from the site myself, so cannot say how long it will take. Quick Pay Survey also has a Facebook page. You can however not send a message there, and it is very inactive, as there has been no posts since the end of 2017. So if you at some point need help, you have to use the form on the website. If you have tried to contact them and have experiences with how good the support is, I would love to hear about your experiences in a comment below. QuickPaySurvey.com is not a scam, as it does offer a real way to earn. This does however not mean it is worth the time. So let’s sum up the pros and cons to get a better overview. 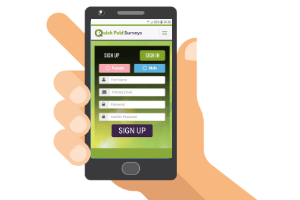 Overall, Quick Pay Survey is a website, where you can earn a little extra cash. It can however take some patience, because of the limited earning opportunities. In addition to this the rewards are also low compared to similar sites. Overall, the site does in my opinion NOT live up to its name. There are many sites with much better opportunities, higher rewards, and lower payout thresholds. You can check out a list of the truly quickest paying survey sites – on many of these you can earn enough to get paid on the same day as you join. If you have any comments, questions, or have any experiences with Quick Pay Survey yourself, I would love to hear from you in a comment below. QuickPaySurvey.com is a legit survey site, and you can actually earn on the site. It does however not live up to its name, as it can take some patience to get to the payout threshold because of the limited earning opportunities and low rewards. There are in general many survey sites with better and more opportunities.